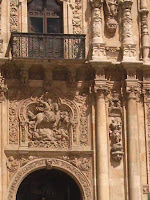 Maite's Art History: Renaissance Architecture in Spain. Si me ofreciesen la sabiduría con la condición de guardarla para mí sin comunicarla a nadie, no la querría. Séneca. Spanish painting of the Renaissance: El Greco. It is difficult to mark a strong division between the last Gothic and the Renaissance. Spanish society did not have a developed bourgeoisie and the group having a great power was the nobility. Any kind of attempt to break the established order was crushed so that the Spanish Renaissance is going to be limited to the institutions and people around the Court. This influenced a continuity Middle Ages-Renaissance. In architecture there is a combination of gothic and mudejar forms with Italian influences, that got to the country thanks to the intense commercial relation of Mediterranean ports with Italy and to the exchange of materials and artists between both territories. The Renaissance forms arrived when the Dynastic Union took place. During the last period the last Gothic had an important development, at once with the mudejar influence. This last created civilian works comfortable and chip, with traditional materials such as brick and wood. These influences, at once with the technical tradition of working stone limited the Italian influences. The Italian fashion was limited to decorative aspects, with elements such as grotesques, candelieri or garlands. With the time some pieces were imported as is the case of chimneys, columns capitals and shafts, altars, sepulchres. At the beginning of the 16th century the term was coined because this architecture was similar to the work of goldsmith and silversmiths. Decoration primes over constructio n. The medieval influences still being important: in the outside walls are padded; columns are abalustraded, with Corinthian or composite capitals and a base full of leaves; pilasters are covered with grotesque decoration; semicircular arches are used but segmentalis more common; at arches sides and in freezes medallions are used; the covers continue being crossing vaults with medallions but barrel vaults with lacunaria (caseton) also appear; buildings are frequently ended with crests; in general the proportions are not classical. 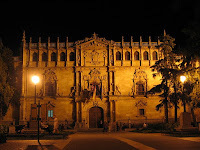 Significant works are: The Santa Cruz college in Valladolid, the Golden Stair of Burgos Cathedral, Salamanca University’s door, the House of the Shells in Salamanca, the Façade of Alcala University, work of Gil de Hontañon. At the same time that the former style other works traditionally Renaissance were built. Both styles developed at the same time and even some architects made works in both of them. 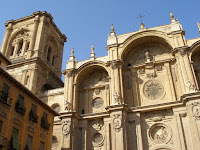 Examples of this works are the interventions in Granada Cathedral, made by Diego de Siloe. 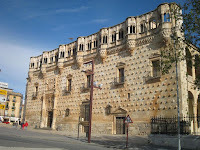 Other architect is Andres de Vandelvira who worked in Ubeda and Baeza. His works are based on architectonical elements, not in decoration. It is during the last part of the 16th century that the Monastery of Saint Lorenzo in the Escorial is built. The style is named after the architect of this work, Juan de Herrera, whose style is influence by the purity of forms of Bramante and Michelangelo, characterised by: solid architectonical structures, lack of decoration, beauty of the building based on the monumentality of the work and the correct use of the elements.